"Want to learn to live like a #Viking? Enroll in Scandinavia's first government-funded training course on Viking life — minus the violence. In a country that delights in its reputation for tolerance, the rebranding of Vikings from violent thugs to peaceable craftsmen is part of a broader resurgence of interest in a historical period that has mostly been embraced by far-right nationalists. Others see it as an effort to reclaim an important part of the country's past, which included not only slaughter but also major achievements. (Don't forget who sailed to North America about 500 years before Columbus!) 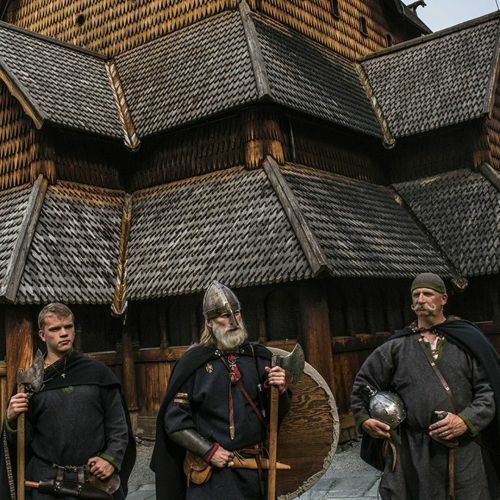 @limauricio photographed Anders Kvale Rue, center — who leads a group of amateur #Viking enthusiasts — with his friends Oystein, right, and Nils Rivrud in front of a 13th-century church in #Heddal, Norway." By nytimes on Instagram.